Thus the unit of FUR is min-1 (Thie, 1995), the same as for Ki. FUR can be calculated from a single late PET scan, like SUV, but blood sampling from the injection to the scan time is required. Fractional uptake rate was previously called Retention index (Ri), especially in analysis of cardiac PET studies. This is discouraged, because the term Retention index has several other uses, also in nuclear medicine. FUR is an approximation to the Patlak plot (MTGA for irreversible uptake) slope Ki, to the extent that at large T (late time after injection) the effective distribution volume term in Patlak analysis is not important (y axis intercept is assumed to be 0). FUR and SUV are proportional, related by plasma clearance rate and a dimensionless initial distribution volume (Thie, 1995). Figure 1. For calculation of FUR, plasma TAC is integrated from 0 (injection time) to the middle time of PET frame (or middle point of PET time range when PET scan consists of several frames). Note that integration to the end of PET data would be a mistake. Mean tissue concentration is then divided by plasma integral to get the FUR value. , giving value Ki=0.0300444 mL*(min*mL)-1. Patlak plot indeed gives a very precise estimate for Ki with these simulated TACs, if line fit is started from 15 min. Instead, FUR is overestimated, approaching the correct value, but not reaching it during 120 min (Fig 2b). Figures 2a and 2b. TTAC is simulated using irreversible 2TCM with parameters representing brain grey matter (a). FUR is calculated at every time point, up to 120 min (red line in Fig 2b), showing lesser overestimation towards later calculation times, but still not reaching the correct Ki (black line in Fig 2b). The bias in FUR, as compared to Ki, is not only dependent on the time of FUR calculation, but also on the intercept of the Patlak plot. If we do the simulation again, this time with 15% lower and 15% higher k3, but keeping other rate constants as they were, we will get the TTACs shown in Fig 3a, and FURs as shown in Fig 3b. Patlak plot will again provide correct Kis (0.0300444, 0.02688, and 0.03293 mL*(min*mL)-1, respectively). The 15% change in k3 changes Ki -10.5% and +9.5%, and an opposite change in intercept (+11% and -9%, respectively). FUR overestimates Ki in all situations, but the overestimation is lower when k3 (and Ki) is increased (Fig 3c); thus true differences in Ki will be underestimated when FUR calculation is used. Figures 3a-c. TTAC is simulated using irreversible 2TCM with parameters representing brain grey matter, (red) and with 15% lower (blue) and 15% higher (green) k3 (a). FUR is calculated at every time point, up to 120 min, with the dots representing the correct Ki value(b). Bias of FUR as compared to Ki (c) is always positive, but lower with higher k3. In the next simulation, k2 is set to 15% lower and 15% higher value, but other rate constants are kept unchanged. This will provide the TTACs shown in Fig 4a, and FURs as shown in Fig 4b. Patlak plot will again provide correct Kis (0.0300444, 0.03338, and 0.02731 mL*(min*mL)-1, respectively). The 15% change in k2 changes Ki +11.1% and -9.1%, and causes a parallel but smaller changes in the intercept (+5% and -5%, respectively). FUR is overestimated in all situations, and not much dependent on the value of k3 (Fig 4c). Even though the effect is small, the smaller k2 (and increased Ki) leads to lower overestimation; thus true differences in Ki will be underestimated when FUR calculation is used, whether the change in Ki is due to changed k2 or k3. Figures 4a-c. TTAC is simulated using irreversible 2TCM with parameters representing brain grey matter, (red) and with 15% lower (blue) and 15% higher (green) k2 (a). FUR is calculated at every time point, up to 120 min, with the dots representing the correct Ki value(b). Bias of FUR as compared to Ki (c) is always positive, and slightly lower with lower k2. The data and scripts used in these simulations are available in gitlab.utu.fi/vesoik/simulations. When the PET tracer is an analog of glucose (e.g. [F-18]FDG) or fatty acids (e.g. 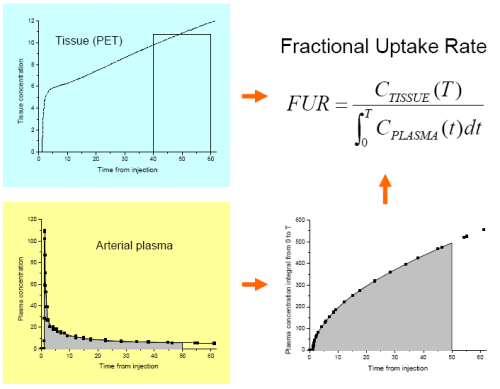 [F-18]FTHA) or other native substrate in the tissue, and it is metabolically trapped in tissue during the PET scan, the FUR estimate, like influx rate (Ki) from Patlak plot, can be used to calculate the metabolic rate of the native substrate. For example, in [F-18]FDG the FUR can be multiplied by concentration of glucose in plasma, and divided by the appropriate lumped constant, to get an estimate of glucose uptake rate. Naturally, the FUR-based metabolic rates contain the same bias as FUR itself when compared to metabolic rates based on Ki. Camici P, Araujo LI, Spinks T, Lammertsma AA, Kaski JC, Shea MJ, Selwyn AP, Jones T, Maseri A. Increased uptake of 18F-fluorodeoxyglucose in postischemic myocardium of patients with exercise-induced angina. Circulation. 1986; 74(1): 81-88. 10.1161/01.CIR.74.1.81. Ishizu K, Nishizawa S, Yonekura Y, et al. Effects of hyperglycemia on FDG uptake in human brain and glioma. J Nucl Med 1994; 35:1104-1109. Ishizu K, Yonekura Y. Clarification of a fractional uptake concept – Reply. J Nucl Med 1995; 36:712. Rutland M, Que L, Hassan IM. “FUR” – one size suits all. Eur J Nucl Med. 2000; 27:1708-1713. doi: 10.1007/s002590000. Thie JA. Clarification of a fractional uptake concept. J Nucl Med 1995; 36: 711-712.